How much longer can NASA endorse disinformation that backs Martian air pressure at near vacuum levels? Updated 5/11/2017. On September 28, 2015 NASA held a press conference at which it was alleged that they had proof of running water at multiple sites on Mars. THE SEPTEMBER 28, 2015 PRESS CONFERENCE AT NASA IS HERE. While the source of the water is not yet pinned down, emphasis was placed on support for the idea of deliquescence. In reference to it NASA argues that perchlorate salts like those found on Mars have a special capability of being able to absorb moisture until they dissolve in the moisture absorbed and form a solution. Deliquescence occurs when the vapor pressure of the solution that is formed is less than the partial pressure of water vapor in the air. This is one possible explanation for formation of Recurring Slope Lineae (RSL) - the dark streaks shown growing on Animated GIF 1 below. They are assumed to be due to running water/brine. Soluble salts will deliquesce if Martian air is sufficiently humid. The NASA press conference does refer to snow seen falling at the Phoenix lander site, however it states that rain has never been seen falling on Mars. It also indicates that it's possible that the running water has an underground source, but proof of that will likely have to wait for results from a ground penetrating radar scheduled to be sent to Mars in 2020. As for no rain, as I originally indicated on my page about ultraviolet (UV) radiation on Mars, while UV at the Mars Science Laboratory (MSL) varied from low to very high, during the first 1,609 sols (Martian days) there was not a single date when opacity was not listed as "sunny." But then JPL altered all low UV ratings. During the first 1,127 of those 1,609 sols there were 86 with no data available (7.6% of the time), so perhaps we're missing something here. What caused the original 16 days with low UV to be altered? This is unknown, but obviously the denser the atmosphere the more likely it is to block enough UV to reach a low rate. A dense atmosphere, of course, is what NASA denies and what we back. Although I cannot rule out arguments that link water's ability to flow on Mars to widespread amounts of perchlorates dissolved in the Martian water, I submit that the running water is more likely to be linked to atmospheric pressure that is two orders of magnitude higher than what NASA has told us. The authors of the NASA study discussed here are operating under the assumption that the average pressure at areoid (the Martian equivalent of sea level) is 6.1 mbar (McEwen et al., 2014). As I'll explain below, I believe that it's closer to 511 mbar. Elsewhere on my Marscorrect.com site I discuss fundamental design problems (tiny pressure sensor dust filters that clog with dust at the time of landing) in the Tavis pressure sensors sent to Mars on the Vikings and Pathfinder, and similar design flaws found on the Vaisala pressure sensors sent up on the Phoenix and MSL. Our report, MARS CORRECT: CRITIQUE OF ALL NASA MARS WEATHER DATA, shows that as a result of faulty pressure data, most of the Martian weather data available today is fatally flawed. AT WHAT LATITUDES, WHEN AND WHAT TEMPERATURES HAVE WE OBSERVED EVIDENCE OF RUNNING WATER? Figure 1A below shows the known locations, but under 4% of the Martian surface has been imaged well enough to see the features. In accordance with the 2011 Abstract by Alfred S. McEwen, Lujendra Ojha, and Colin M. Dundas, Sarah S. Mattson, Shane Byrne, James J. Wray, Selby C. Cull, Scott L. Murchie, Nicolas Thomas, Virginia C. Gulick, RSL appear and lengthen in the late southern spring/summer from 48°S to 32°S latitudes favoring equator-facing slopes--times and places with peak surface temperatures from ~250-300 K. Later it was stated in a paper entitled RECURRING SLOPE LINEAE IN EQUATORIAL REGIONS OF MARS (McEwen et al., 2014) that there is "extensive activity of recurring slope lineae in equatorial regions of Mars, particularly in the deep canyons of Valles Marineris." The McEwen et al., 2014 paper shows the location of RSL at Acidalia Planitia in the northern hemisphere (see Figure 1A below) and states that there is one confirmed site at 35° North latitude (which is the Acidalia Planitia site). WHAT ARE PERCHLORATES? Perchlorates are salts of perchloric acid. An example is potassium perchlorate (formula KClO4). Figure 4A shows evidence in the form of spectra for magnesium perchlorate, sodium perchlorate and calcium perchlorate. Light is being absorbed at wavelength of 1.9 and 2.1 microns. These wavelength match what is seen with hydrated salts of perchlorate (ClO4). This means that there is water in the molecular structure of these salts. Ojhu claims that the Mars Reconnaissance Orbiter (MRO) observes the surface of Mars every day at roughly 3 pm which is the driest time of day. He says that most of the liquid water will have been completely evaporated then. However, he states that the molecular water trapped inside the salts will have been a bit more stable and that is exactly what they observed. This means that the source of molecular water or water in the crystal structure of salts is either due to RSL or some other processes that created these streaks. Regardless the presence of hydrated salts in the slopes means that the streaks are due to contemporary liquid water. Likewise at Palikir Crater they see presence of hydrated salts only when the streaks are present. WHAT WAS NEW AT NASA'S ANNOUNCEMENT AND WHAT CAN BE SAID ABOUT THE MOVIE? Whereas much of the NASA press conference of September 28, 2015 was a repeat of what was known and published by the same people up to four years before, it seems like what's new, although delayed for release to help publicize the opening of the movie THE MARTIAN (see the trailer here) four days later, was that there's a 100% correlation between detection of hydrated salts of perchlorates with the presence of RSL. Our family saw the movie on October 13, 2015. The film was made with some collaboration with NASA. When a storm hit early in the story (48 seconds into the trailer) astronaut Mark Watney got literally blown off his feet. If Martian air pressure is as low as NASA claims, that would never happen on Mars. Note: The landing coordinates for Watney's fictional landing in Acidalia Planitia are 31.2° North, 28.5° West. There are RSL in Acidalia Planitia, but so far the only such evidence published for running water is at 35° North (I don't yet have the longitude) which would be 224.2 km/140.125 miles further north. Watney's spacesuit was punctured during the storm and there was discussion about how that should be fatal in a few seconds (if NASA is right about a near vacuum pressure). Watney survived because the projectile that punctured his suit was surround by his blood which clotted and seal his suit from a further drop. This is reminiscent (in reverse) of our claim that when the Viking, Pathfinder, Phoenix and MSL pressure sensors were first exposed to the Martian air pressure, the dust and sand were sucked into the pressure tube and immediately clogged the tiny dust filters (see Section 2.3 of our Basic Report). 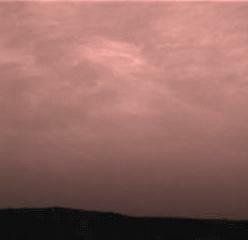 The film did not (in general) show the correct color of the Martian sky. Further, although the water at RSL was surmised back to 2011, and certainly known about to the film's producer a few months before the film's release, there was no reference this in the film. The discovery was so important that it would have been justified to delay release a month or two in order to get this fact across to the public. Mars is a harsh place to live, however so is much of Arizona, Utah and New Mexico. But Mars is not as harsh as the film portrays. The film did appear to be loyal to the novel by Andy Weir, but the novel is out of date. We maintain weather data based on what the MSL's Rover Environmental Monitoring Station (REMS) originally published and often revised (at times after they saw our corrections or reviews). We believe that what we offer is the world's clearest view of MSL data problems. Table 3 below will take you to our records and show you what they recorded as high and low air and ground temperatures seen so far at MSL Curiosity. Sols 1019 to 1,213. Ls 0 to 90. -24 on Sol 1,214 (This is only through Sol 1,221). (This is only through Sol 1,218). -1 on Sol 1,221 (This is only through Sol 1,221). -94 on Sols 1,184 -94 on Sol 1,221. (This is only through Sol 1,221). NOTE: As is shown on the figure below, at no point in the 1,690 sols since landing (as of February 16, 2107) have any relative humidity figures been included on reports by JPL's REMS Team.